I've seen this info a few place around the net and found it good reading so I thought I'd post it here. The 12AX7 is a high-mu twin triode which operates in typical service as a class A amplifier, in the preamp stages of high fidelity, musical instrument, and public address amps, as well as professional line and microphone preamps, and many other audio and communications devices. The demand for the vintage USA and European versions of this tube are beginning to outstrip the supply, and, as a buyer, you need to carefully consider what is available, the device you will use it in, and what your budget allows. The highly regarded vintage brands of Telefunken, Mullard, Amperex, and RCA come at an appropriate premium price over other brands. While this higher price is justified (these tubes sound wonderful and are very long lived) other vintage brands are often just as good. Brands like GE, Sylvania, Tung-Sol, Motorola, Raytheon, and Zenith are often overlooked, but usually perform just as well as the more famous vintage brands, which makes them a terrific value, especially as the stocks of New Old Stock (NOS) tubes vanishes. Indeed, some of these were made by RCA for these other labels, and others like the Tung-Sol and Sylvania have their own followers who prefer these brands over the higher priced premium labels. There is intense hype out there about the 12AX7, and even some absolute fantasies. Some of the European labels have strong snob appeal, which can cloud accurate judgment of these very good tubes, and many self-proclaimed tube experts have either praised or shot down some vintage brands which deserve neither. If you are new to tubes in general, or are replacing a set of Russian or Chinese current production 12AX7 tubes with vintage NOS, you would do well to try several different brands and hear for yourself the sonic nuances. Then you would be well advised to lay in a stock of the brand of your choice "for a rainy day". 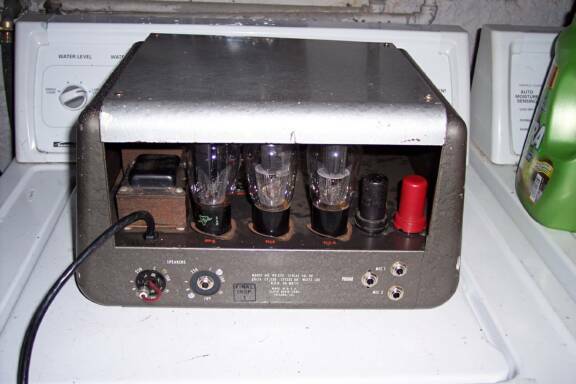 12AX7: the original version of this tube. This can only be used in parallel filament circuits. This is not a big deal as virtually all audio equipment is of a parallel filament design. These often have large rectangular plates with several horizontal ribs. The older versions have blackplates, which are often preferred by audiophiles. 12AX7A: This version can be used in series or parallel filament circuits. These usually date to the 1960s and have greyplates. 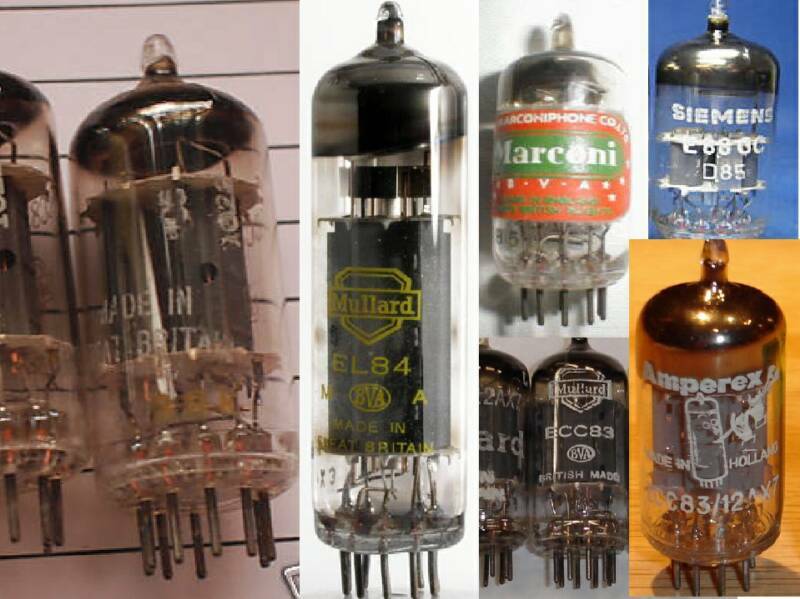 Vintage versions of these are about the most sought after tubes of any type today. Often RCA and GE made these for electronic organ manufacturers, and have the organ brand name on the label. These are usually specially selected tubes, and are a great buy---when available! Sometimes, 12AX7A tubes made for the US Military are labeled 12AX7WA, and I have seen WB and WC versions. The W is the military type code, A,B, and C are progressively later productions. These are nice military spec tubes. DO NOT confuse these with current production Russian or Chinese crap with the suffix WX, WB, or WC! These are not military tubes and are not NOS tubes at all! ECC83: This is the European version of the 12AX7, and is identical to it. 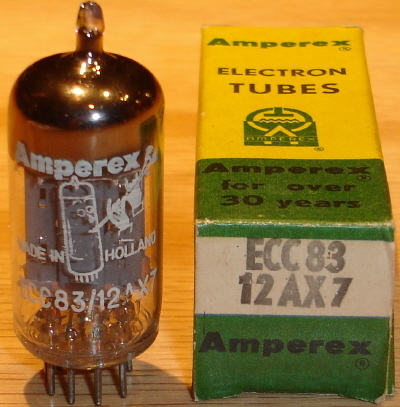 Most tubes with ECC83 listed on the label are European, and the ones in demand are Telefunken, Amperex, Mullard, and Siemens. More difficult to find but worth seeking are German made Valvo and the early Holland made Philips Miniwatt and Philips "SQ". 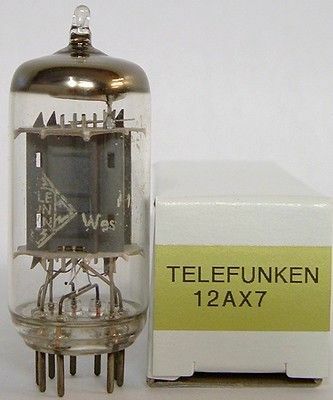 Telefunken tubes have a diamond shape molded into the glass on the bottom center of the tube. The most desirable of the Telefunken ECC83 tubes is the "smoothplate" or "flatplate" versions. Like the name implies, the dull grey plates are perfectly smooth. It does not matter if some of these on the market are labeled for Fisher or Dynaco, as Telefunken made these tubes for many OEM applications. They are the EXACT same tube regardless of the label. 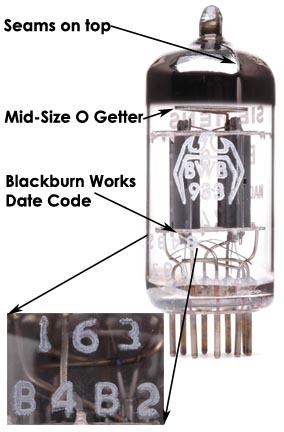 Amperex and Mullard tubes have a pair of alpha-numeric date codes printed in dark grey near the bottom of the tube. The rarest of these are the BugleBoy cartoon tube label for Amperex (especially if it also has the treble clef music symbol next to the Bugleboy image), and the older Mullard logo that looks like a shield, especially with the letters "BVA" below it. 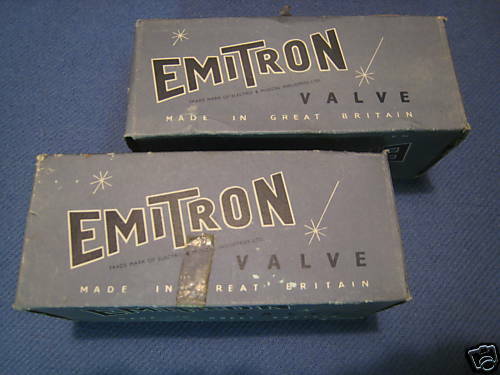 The 1950s versions of these tubes often had long narrow plates, with D or square getters, and are the scarcest and finest sounding of these two brands. BEWARE: the Amperex Bugleboy and Telefunken smoothplates are being faked! The fake Amperex may have the words "Bugleboy" and the cartoon tube on the box, and the label will not wash or wipe off. The fake Telefunken may have gold pins (real Telefunken ECC83 tubes had only standard pins) and a perfect, baked enamel label that won't wipe off. 7025: This is the low noise, "industrial" version of the 12AX7. This has a spiral wound filament which reduces hum and noise. These are usually the best choice for demanding hi-fi applications, although the premium brands and blackplate types also have very low noise. ECC803S, E83CC, E803CC: This is a premium European version of the ECC83. The "S" indicates Special, and these tubes were screened for low noise and matching internal triode elements. These are rare in the USA. Telefunken and Siemens are the brands most often spotted, although several of the Mullard factories made these for various labels. Most of the Telefunken and Siemens tubes had gold plated pins. 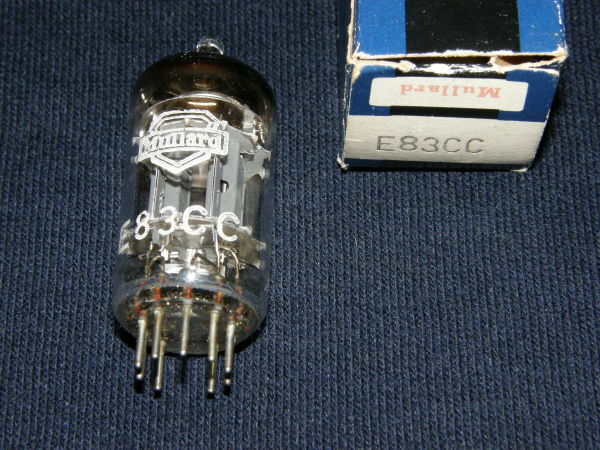 Sometimes the E83CC also carried the 12AX7WA military type label, even though it is a European made tube. 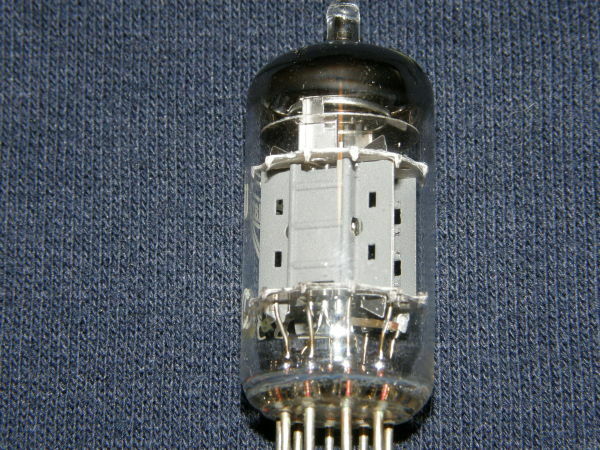 B759: This is an ultra-low noise version of the 12AX7, with matched triode elements. 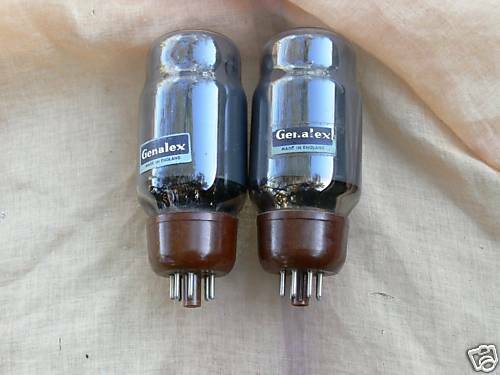 To my knowledge, only Genalex (Marconi-Osram Valve Co.) made these in England for their "Gold Lion" series. Extremely rare in the USA. 6681: This is listed in some tube manuals as a "special 12AX7", otherwise the electrical specs are the same as the standard version. Being an industrial type it most likely has a ruggedized filament, and is built to withstand many on-off cycles. I believe only RCA made these, regardless of brand on the label. UPDATE: One astute customer has informed me that GE offered 6681 tubes with the typical top seams, date codes, and "Gt. Britain" marking that indicates English Mullard manufacture. 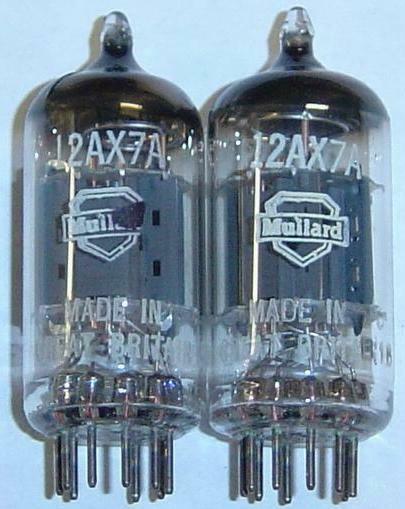 Indeed, some GE 12AX7 and 7025 tubes from the 1970s were also Mullard made, so they must have made some 6681s for GE as well. Overall, the 6681 is an excellent step up in quality from the standard 12AX7, and is a bargain at current prices. 5751: This version was usually the one made for the US military. These have a lower gain than the 12AX7, but are otherwise totally compatible. Great hi-fi tubes, as the lower gain reduces noise and microphonics. These are all ruggedized and most can withstand a drop on the floor. The internal triode elements are matched as well. The early versions are more sought after as they usually have extra support rods and an extra mica spacer on top of the plate structure ("Triple Mica"), as well as blackplates, all said to contribute to low microphonics. Don't overlook the greyplate versions, they are also excellent tubes, and many of these have the triple mica as well. The GE non-military version is usually the "five star" series, intended for broadcast use. 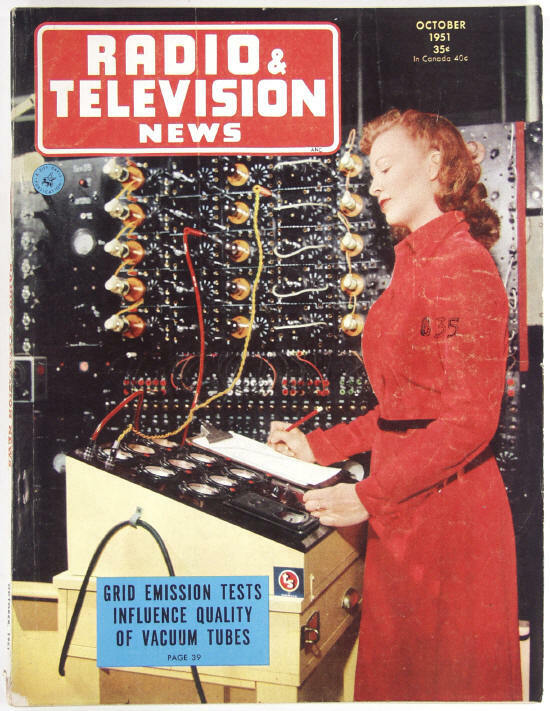 The RCA broadcast type is the "Command" series. Both the RCA and GE broadcast types are scarce, as are any of the triple mica types. TELEFUNKEN, SIEMENS, VALVO, LORENZ, and other German made NOS: These tubes are usually characterized by an impressive open "air" at the top end. The soundstage is large, even in mono applications these tubes have a great 3-D image. The midrange is ruler flat, and the bass is tight and accurate. These tubes have a fine sense of dynamics, and most are impressively quiet. These are not "warm" tubes, and to some ears their lack of midrange warmth may be heard as bright. I tend to think of them as accurate, and their clean, focused sonic image is astonishing. My personal favorites. Oh, and here is a little secret: the Telefunken ribbed plates sound pretty much the same as the smoothplates! In spite of the "shootouts", and "Some Guy's Tube Lore", and other claims to the contrary, the sonic differences between these two tubes (made in the same era at the same factory) are small and very subjective. Don't let anyone tell you what tubes you should like and what you should not like! AMPEREX, PHILIPS, MAZDA and other Holland/France/Belgium made NOS: These tubes are a great balance of a clean, airy top end, nice midrange warmth, and accurate bass. They are very pleasant, clean, and musical to listen to in hi-fi applications. Unlike other clean European tubes, these break-up impressively when overdriven in a guitar amp. The rare longplate versions are the same, but with even more soundstage space and detail. The Mazda adds a nice bit of dynamic punch to the sound. MULLARD, GENALEX, BRIMAR, and other British made NOS: Like a warm British jacket of the finest tweed, these glorious tubes have an attractive sweet warmth in their midrange and lower regions. The top end is silky and pleasant, without being rolled-off. The best of these tubes retain a fine sense of "air" at the top, and the upper midrange is smooth and liquid. These tubes reproduce the human voice, especially female voices, with haunting realism. The rare longplates and Genalex versions have an eye-popping huge soundstage, razor sharp focus and detail, and an uncolored top end while retaining the warmth of the lower priced versions. RCA, RAYTHEON, GE, SYLVANIA, and other USA made NOS: This group is very diverse. The RCA, Raytheon, and Sylvania blackplates are among the best here. These are very musical tubes with air and sparkle at the top end, warmth in the mids, and great bass. The RCA are drop dead beautiful in guitar amps, even the lower priced greyplate and longplate versions. They also have a wonderful "phat" gritty sound when overdriven in these amps. The blackplates and most tubes made for organs are very quiet. The greyplate GE is an all-around nice-guy tube to listen to, the longplate here possibly getting the nod for hi-fi use. The Sylvania greyplate and military versions are clean and a bit bright, but the Sylvania 5751 variants are very balanced and pleasant to listen to for hours. 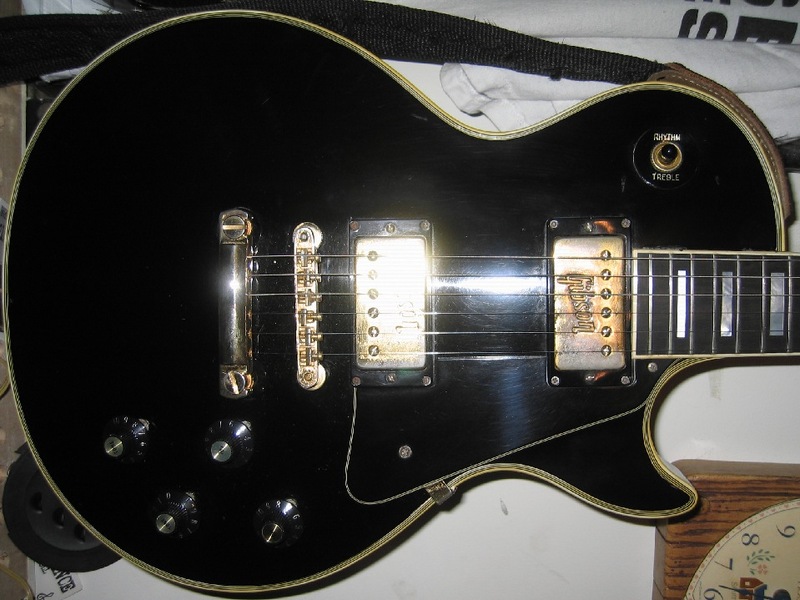 The GE blackplate 5751 triple mica is also in great demand as a very musical vintage tube. The RCA 5751 is more like the Mullard, with a rich warmth and wide bandwidth. Currently, the USA made tubes are a nice surprise with their low prices as compared to the European types. 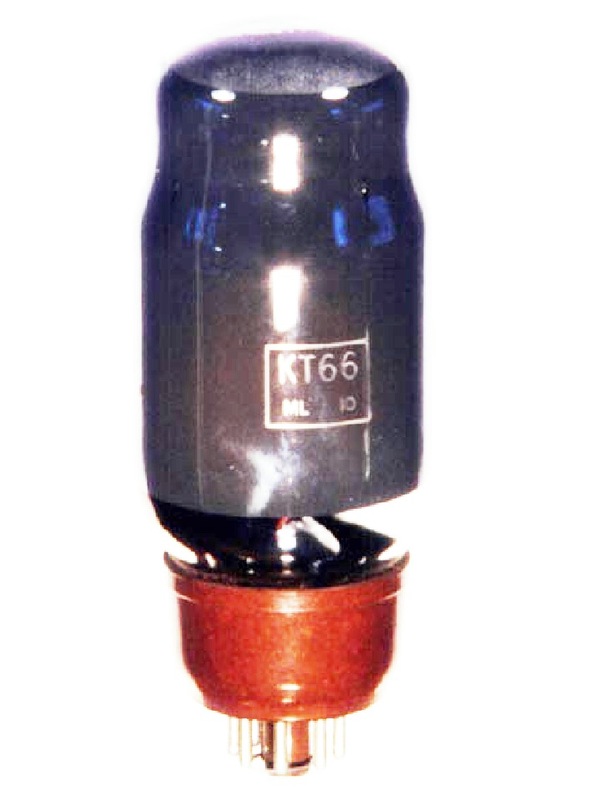 The KT66 is a very well known audio output beam tetrode valve. Our exhibit is a post-WW2 device, probably dating from the 1960s. 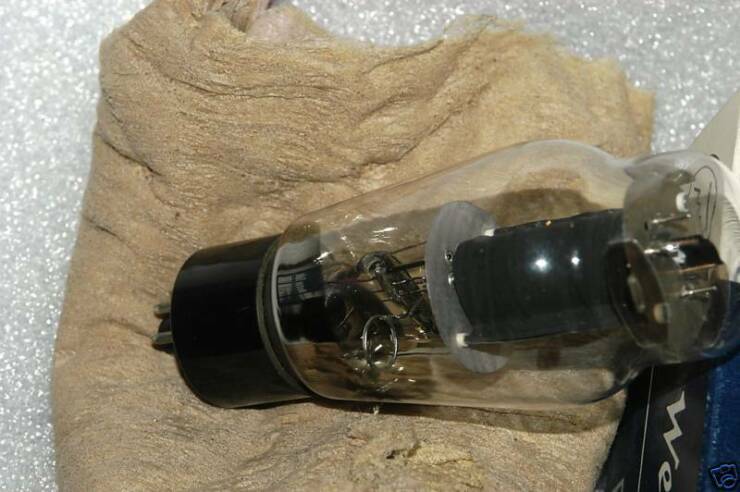 The production from the 1970s lacked the internal carbon dust coating of the glass bulb. In the 1950s the production used black base caps and pre-WW2 had the classic envelope shape. 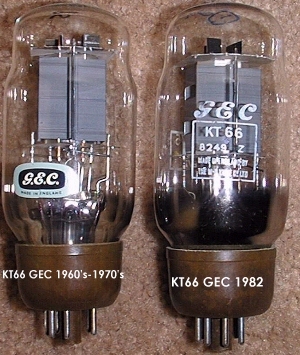 The KT66 was essentially a 6L6 redesigned with a larger cathode and a shorter, fatter anode. The KT66 had less rapid acceleration, longer electron paths, and almost no kink. It was ace for audio hi-fi but the electrons took longer to reach the anode and were more open to influence from magnetic, etc, fields on the way. Moreover, under HF conditions the electron stream was not perfectly in phase with the grid signal and this resulted in a loss of output power if used for RF applications. The figures given are for single ended use, but a pair run in ultra linear AB2 push pull will deliver 50 Watts with 2% distortion. It is not uncommon to find these valves used in parallel push pull. Here each single valve of the push pull pair is replaced with two valves connected in parallel. A 100W amplifier results. The shape of the envelope is a mixture of the classic shape and the wide tube. Due to the metalisation on the inner of the envelope the electrode structure is obscured. The classic envelope is 48 mm in diameter and, excluding the IO base pins, is 113 mm tall. There's a certain appeal in exotic places or, in this case, far-away tubes. Even at this late date, there aren't a lot of West European or Japanese tubes in the hands of North American collectors, so the ones that do appear are somewhat mysterious. The accompanying table lists a goodly collection of brand names for foreign receiving tubes. This may be helpful in two ways: the simple pleasure of unfamiliar and often bizarre names and the satisfaction of identifying the nation of origin of an unknown tube. A brand listed here is normally given under the country of manufacture. A few trade names were used in two countries, hence appear twice. There was a large international tube trade within Europe, plus exports to everywhere else but North America. (As one exception, Star and Peerless tubes were part of a brief attempt by Philips in the '20s to sell Dutch-made tubes in the U. S. and Canada respectively.) Some of the trade names duplicate unrelated U.S. brands. 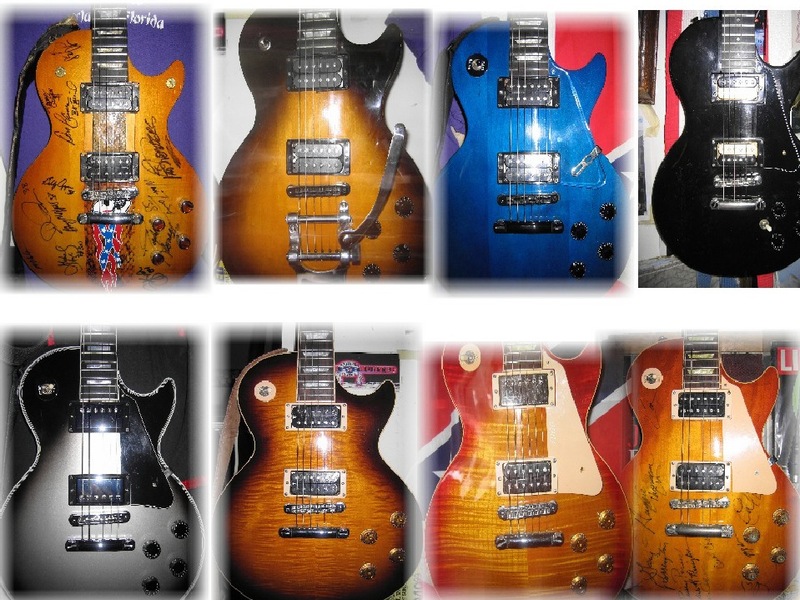 These include Champion, Delta, Marathon, Powertone, Pur-A-Tone, Triotron, Ultra, and Zenith. However, the British and American Cleartron brands were related. RCA, in its large private-brand business, was set up to make at least some U. S. tube types for export and sale by others under the Adzam, Castilla, Franklin, Mullard, Philips, Purotron, Radio Equipmente, and Triotron brands. While we're discussing Western European tubes: there was a great difference in practice between tube manufacturers there and here as to type designations. For anyone who thinks the numbering of American tubes is complex, consider that the Radio Manufacturers Association after 1932 centrally registered tube designs for the industry and assigned type identifiers. As a result, a 6SK7 is reliably a 6SK7, regardless of who made it. This practice guaranteed a rich market for tube-substitution books. The mess was partially straightened out postwar, when the European industry developed its own tube-registration agency, known as Pro Electron. 1. P. H. Brans, Radio Tube Vade-Mecum (Antwerp: Editions Techniques P. H. Brans, 1946). 2. G. Salzmann, Röhrencodierungen der 20er und 30er Jahre (Bochum, Dr. Dieter Winkler, 1988). 3. G. F. J. Tyne, Saga of the Vacuum Tube (Indianapolis: H. W. Sams & Co., 1977). 4. J. W. Stokes, 70 Years of Radio Tubes and Valves (Vestal, NY: Vestal Press, 1982). 5. K. R. Thrower, History of the British Radio Valve to 1940 (Ropley, Hants. : MMA International, Ltd., 1993). 6. J. W. Stokes, “British Valves,” OTB, Vol. 15 No. 1. 7. A. S. Douglas, “Star Tube,” OTB, Vol. 25 No. 2. 8. L. A. Sibley, "RCA and Private Brands," in Tube Collectors Assn. Spl. Pub. No. 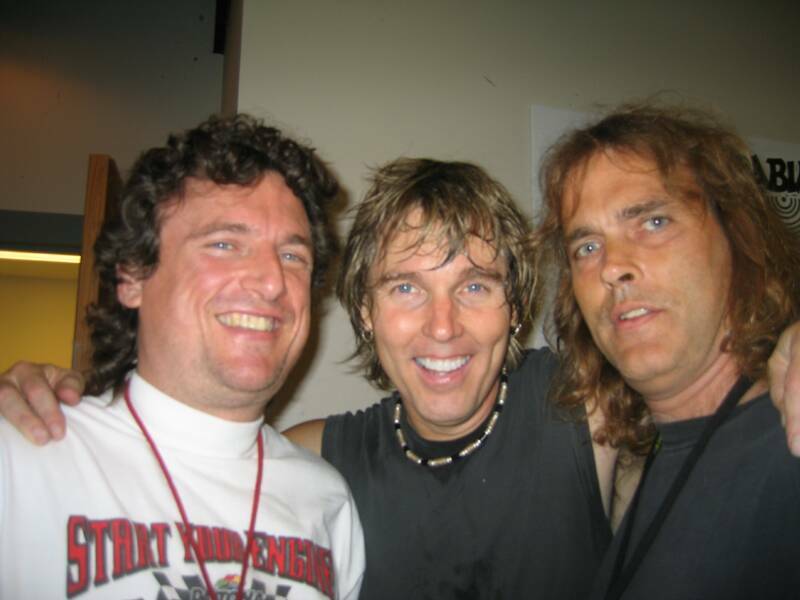 11, 2006. 9. S. Okamura, ed., History of Electron Tubes (Tokyo, Ohmsha Ltd., 1994), p. 79. The U. S. tube industry, more than any other, featured a panoramic diversity of brand names. These represented the manufacturers, large and small; the set makers; and a host of private brands used by regional distributors. The hugely successful 201A appeared under 600+ names in the '20s-'30s. 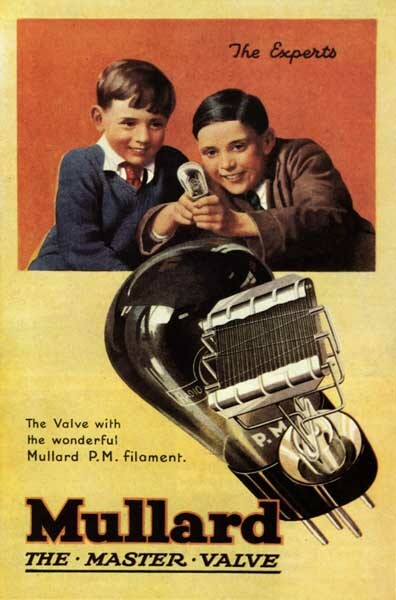 RCA is known to have supplied tubes under 250+ private brands in the '30s and later. As with any consumer product, the marketers strove for brand identities that conveyed an image of value and effectiveness. Here are some clusters of names with particular associations. "Dynes": Aerodyne, Anodyne, Electrodyne, Kinodyne, Magnadyne. "Tones": Bell-Tone, Bestone, Brilliantone, Claritone, Clearatone, Goldentone, Goldtone, Good Tone, Grand Tone, Keentone, Kleartone, Kleen Tone, Kleer Tone, Live-Tone, Mastertone, Melotone, Nutone, Nutron, Operatone, Pep Tone, Perfectone, Powertone, Pur-A-Tone, Qualitone, Radiotone, Real-Tone, RY-TONE, Silvertone, Supertone, Tripletone, Unitone, Wavetone, Weltone, Wonder-Tone. "Trons": Actron, Airtron, Alltron, Amertron, Amplitron, AudioTron, Aratron, Archatron, Arco-tron, Arctron, Atron, Bostron, Claritron, Cleartron, Delatone, Detectron, Detron, Dextron, Diatron, Dis-X-Tron, Distatron, Duotron, Duratron, Dynetron, Echotron, Econotron, Elektron, Elitetron, Empire-Tron, Esetron, Etron, Eurekatron, Exceltron, Fastron, Findtron, Fultone, Greentron, Heliotron, Hi-Constron, Hubtron, Hytron, Icatron, Imperialtron, Lectron, Magictron, Magnatron, Mellotron, Monotron, Musiktron, Neotron, Neptron, Novatron, Oscillotron, Peertron, Perfectron, Philotron, Phonotron, Pilotron, Playtron, Purotron, Quadrotron, Q. V. Tron, RA-DEX-TRON, Radiotron, Raytron, Rextron, Royaltron, Solartron, Sonatron, Supertron, Syntron, Tectron, Teletron, Teltron, Thermotron, Trio Tron, Triple Tron, Urekatron, Vactron, Voltron, Valutron, Vultron, Westron. 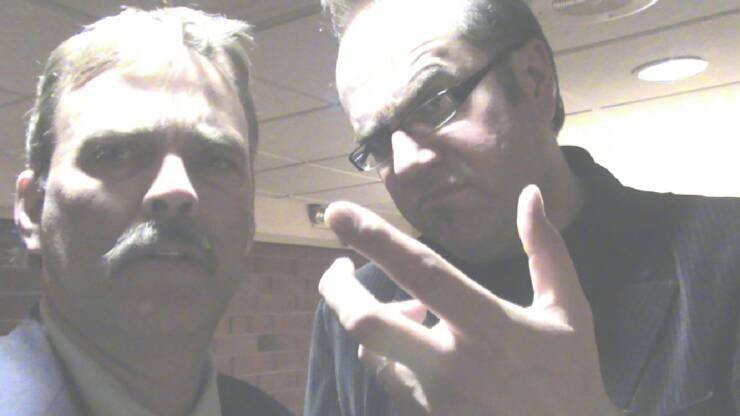 Tough Guys: Champion, Commander, Conqueror, Courier, Crusader, Defender, Dictator, Kadette, Leader, Legion, Pace Setter, Pioneer, Trail Blazer, Victor, Viking. Noble Titles: Admiral, Air King, Aristocrat, Emperor, Imperial, Knight, Master, Premier, Regal, Regent, Rextron, Royal, Sovereign. Antiquities: Ajax, Apollo, Atlas, Diana, Hercules, Jove, Neptune, Marathon, Mercury, Neptune, Odeon, Plato, Samson, Sparton, Titan, Titania, Trojan, Troy, Venus, Vesta. Natural Features: Arcturus, Bright Star, Comet, Crescent, Eclipse, Golden Comet, Meteor (forgetting how fast meteors burn out! ), Rainbow, Skyline, Star, Sun, Sunlight. Geographic Concepts: Atlantis, Bay State, Blazing Trail, Boston, Cambridge, Coast to Coast, Continental, Denmark, Dixie, Everest World Top, Gibraltar, Globe, National, Panama, Paramount, Peak, Western, Zenith. Weapons: Armor, Arrow, Golden Shield, Shieldplate. Price Symbols: Buck, Dollar, Econtron, True Value. Things That Fly: Aerodyne, Airhawk, Blue Bird, Bumblebee, Eagle, Oriole, Sea Gull, Songbird. A freaky brand was "Cecilian," from the Esetroc Mfg. Co. in Newark. "Esetroc" looks like "Cortese" spelled backward, so the brand name may have been a play on national origin! The British and European makers were much more staid in their choices of names. The Japanese tube companies played the American game to some extent, with brands like Applotron, Cymotron, Don, Eastron, Kingtron, K. O. Tron, Orion, Rex, Robin, Suntron, Sterling, and Victron. Radio Waves, the journal of the Historical Radio Society of Australia, carried "The Valve Box," a series of 16 articles by Fin Stewart in the late '90s. Stewart is known to AWA readers by his article on Australian tube companies in Vol. 6 of the Review, and by two chapters of the "Valve Box" series printed in the OTB in 1999-2000. One of the characteristics of the radio and tube markets in much of the world was that British, European, and U. S. manufacturers competed in it. So authors like John Stokes in New Zealand and Stewart in Australia had to be "fluent" in tubes from all sources. The result is a rich world view. Stewart's series covered tube-development history, with products from Germany, Holland, Britain, France, the rest of Europe, and the U. S. He devoted specialized coverage to Arcturus and Western Electric. The set constitutes an insightful and entertaining "read." Now he has assembled the full series into a book. It's 97 pages in A4 (8 1/2" x 11") format, xerocopied and comb-bound. It's available for US $25, air postage included, from Fin Stewart, "Cockerdale," 380 Bulga Rd., Wingham, NSW 2429, Australia. He can be reached at ferowatte.m.380@bigpond.com, and PayPal payment can be sent to cockerdale1@bigpond.com. A while back this column featured a story on the tube collection of Bob Deuel, K2GLO. It would be valuable to write up other such collections, as each tube enthusiast has his own ideas of what to acquire and how to display it. The very nature of tube display is evolving, with the arrival of Web-based photo galleries. Two prominent examples are Jeremy Harmer's "Virtual Valve Museum" (http://www.tubecollector.org) and Norm Wilson's "Transmitting Tube Museum" (http://n6jv.us). These provide an educational outreach that is lacking in conventional private displays, allowing anyone to check up on odd or rate tubes. Collectors who would like to share the news of their collections, in physical or Web-page form, via this column are welcome to contact the writer at tubelore@jeffnet.org or (541) 855-5207. Power is critical to the growth of high fidelity as a market. It's easy to stick a label on an amplifier with a big wattage number, and it SELLS. Ever since the early 1950s, consumers have been told to seek more power when looking at components, whether separates or receivers. The fact that speaker efficiency is just as important, or that average bass-reflex speakers will give plenty of loudness with only 30 watts per channel, is of no importance in this power war. In the halcyon days of hi-fi, getting more than 30 watts was relatively expensive. It required at least four 6L6Gs at typical 300-400v plate voltages, or transmitting tubes at much higher voltages. Even though a pair of 807s would do the job, the plate voltage would have to be more than 550 - this usually required oil capacitors in the power supply, plus more expensive transformers that were rated for such operation. The price added up, and by the time the customer has paid for a tuner, turntable, speaker, and the mandatory cabinet, there isn't much left for a transmitting-tube power amp. There was unquestionably a strong desire for such products. 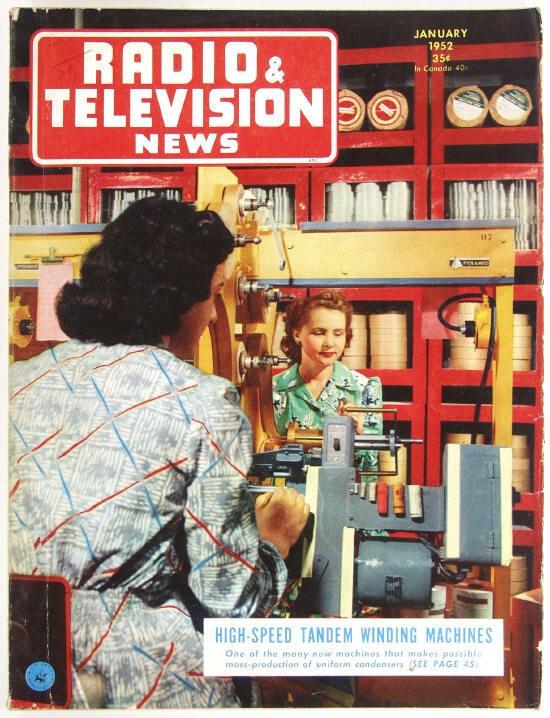 Construction articles in AUDIO ENGINEERING in the 1948-1954 time frame often featured large tubes. The AUDIO ANTHOLOGY books, volumes 1 through 3, contain 21 amplifier construction articles, of which one used 211s, two used 807s, one used 845s, and one used the type 6146, which was new in 1952. The vast majority of the amp circuits were good for less than 15 watts, which most people thought was plenty. The transmitting-tube circuits must have been seen as luxury projects intended only for the serious "audio bug". Such amps were NOT available from early hi-fi dealers. Power was the need, even though most people were using relatively efficient speakers and horns were at the peak of popularity. Bear in mind that these users were nearly all middle-aged men who listened primarily to classical have been desperate for louder crescendos, perhaps to drown out the wife's TV shows? Obviously there was a demand for a tube that could do more than 50 watts, with low distortion, at a cost below that of the 6146. Mullard's EL37 could do it but was about as expensive as the 6146. The 6550 was designed for home audio equipment, and it was designed to save money. No plate cap meant no plate cap connector, with the added advantage of less risk of electrocution to the user when replacing tubes. A large octal base with a metal ring at cathode potential was another safety feature which also improved electrical stability. Tung-Sol engineers had a distinctive envelope made for the tube, derived from the older "ST" shape. This squat, rounded "Coke bottle" appearance set the tube apart from the crowd. It might have been a marketing ploy, I suspect--it makes the tube LOOK powerful and tough. For many years, Tung-Sol's version was seen as one of the best power tubes on the market. But, in 1957, a competitor appeared from England. 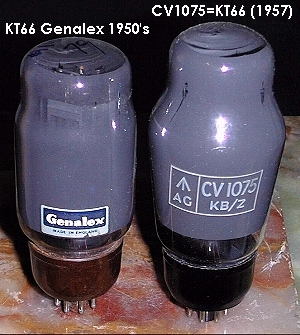 The Marconi- Osram Valve Co. of Hammersmith, London, which already made and sold the KT66 and KT77 beam tubes under the Genalex name, introduced the imposing KT88. Its improved ratings made it a popular substitute in hi-fi amps. The first popular British amp to use the KT88 was the 50 watt Leak TL50+ in 1957. The first popular American amplifier was the early Dyna Mark III. Other notables were the Harman-Kardon Citation II, Heathkit W-6M and McIntosh MC275. And one of the largest guitar amps ever made, the Marshall Major of 1967, used four KT88s at 650 volts to deliver 200 watts. 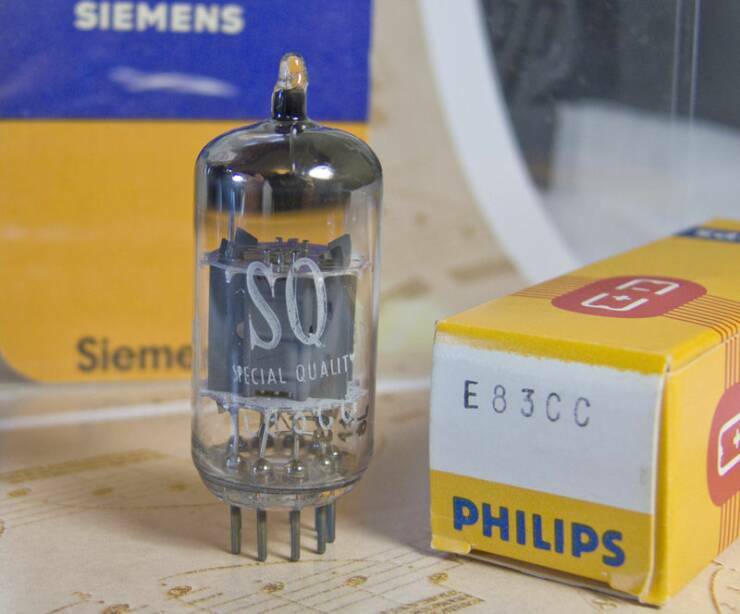 Although the 6550 was a tough tube, operation at above 550 volts in triode, near-triode or ultralinear connection was very hard on it. And in spite of its greater grid leakage currents, the KT88 could handle those operating conditions very easily. 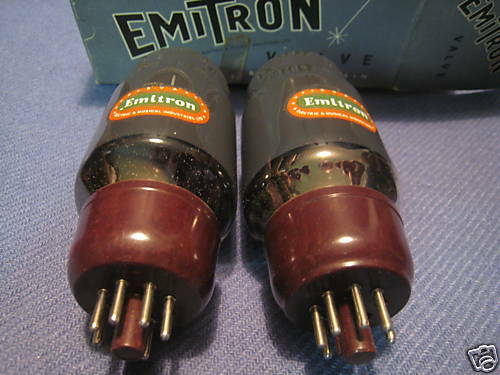 By the 1960s, these tubes had set the standard for power amplification. So it was inevitable that other makers would introduce their own versions. GE came out with the straight-sided 6550A in 1971. It was called 6550A, because of the introduction of an exotic 5-ply metal plate material manufactured by Texas Instruments. This metal, produced by cladding a copper and iron core with aluminum outer layers using explosives, made for a more reliable tube with greater bias stability. The clad metal was better at dissipating plate heat, and it thus lessened plate and grid emission and reduced hot spots on the plate. Sylvania wanted to get a piece of this action, so they introduced their own 6550A in the early 1970s. It is taller and skinnier than the GE, and has quite different mica spacers. But its plate looks exactly like the early GEs, complete with rough-looking spot welds. In fact, it looks suspiciously like a Sylvania 6L6GC or 6CA7 with a large metal-ringed base. Some experts claim that this tube was made by GE under contract, and a few are insistent that it never existed at all! Yet I recall seeing it occasionally in guitar amps during the 1980s. Sylvania apparently had such difficulty competing with GE for this market that production ceased in the early 1980s; I don't recall seeing any that were date-coded after 1984. Many were rebranded and sold by RCA and Westinghouse. Excerpts from original article in Fall 1995 Vacuum Tube Valley Magazine. This back issue is available - see home page. The fact is this: many NOS tubes have developed cult followings, because of the efforts of gurus to hype these tubes into godhood. Usually the tubes in question deserve the good reputation, especially given the poor quality of current Chinese tubes. So, consumers are exhorted to search out Tung-Sol 6550s, and Western Electric 300Bs, and Telefunken smooth-plate ECC83s, and a few other things. This has driven the prices of the things to outrageous levels. There is a brand of tube that you have not heard of. It was introduced in the early 1950s, and was bought by virtually only one customer: the U.S. military. A few of the tube types this company made were commonly used in the electronics in early ICBM warheads. These tubes were used in missiles because they were the most rugged, overdesigned and extravagant tubes available. Their primary reason for existing was because the U.S. Air Force wanted super-tough tubes for use in missiles and avionics, in a steady supply. To win the Cold War, of course. The identity of this mystery tube maker is so unexpected that tube "experts" will probably joke about it. But the fact is: these super-tubes were made by an obscure division of Bendix Aviation Corporation. The plant in which they were made was called Bendix Red Bank Division, Eatontown, New Jersey. Thus, they are called Red Bank tubes. Even though they were second-sourced by Tung-Sol and, later, Cetron, the "Red Bank" name sticks to all the special types in this series. 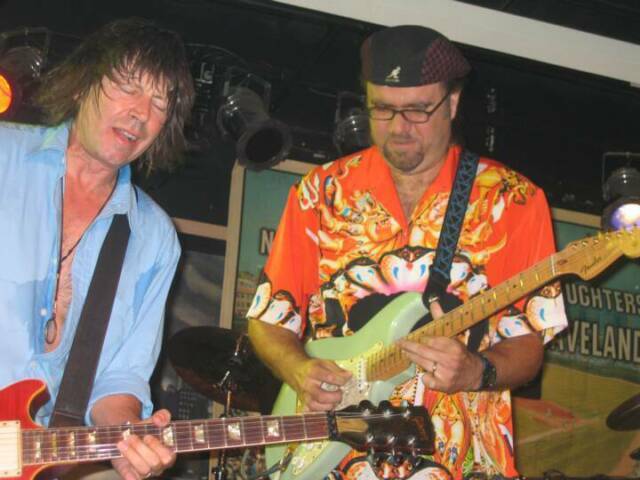 You guitarists know what else was made in the Red Bank/Eatontown area.....yes, Danelectro guitars and amps. 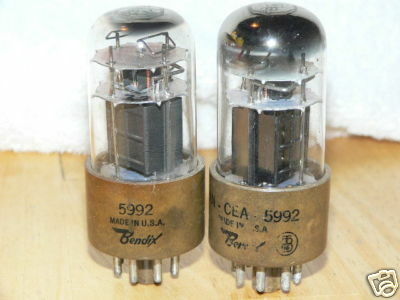 No doubt the Danelectro engineer knew about the Bendixes, but didn't dare specify such expensive tubes for guitar amps. You have to look a bit askance at "tube experts" who try to tell you what the "best" tubes are. They are biased in favor of something, often something they themselves have a few hundred of, hidden in a closet. All bets are off when you bring up Red Bank tubes, because they ARE the best ever made- from the standpoint of reliability, consistency and physical toughness. And as far as I know, NOBODY is hoarding Red Bank tubes, certainly not like 300Bs or Tung-Sol 5881s. And please don't wave those cute RCA "Special Red" things at me. Good they may be, but next to Bendix Red Banks they seem like pale imitations. Red Banks were NEVER used in audio equipment. All of them were originally versions of some commercial prototype, but usually used a nonstandard base pinout. In the advertisement shown here, most of the types available in 1955 are shown. Note the many versions of the 6X5 rectifer, but the few signal or power types. So, no equipment known is wired for them, except possibly some scrapped ballistic-missile assemblies rusting in a junkyard somewhere. Those few types usable for audio-the 5992 beam tube, 6094 beam tube, 6384 beam tube, 6385 and 6900 dual medium-mu triodes-can be retrofitted to guitar amps and high-end equipment, by rewiring the sockets. I was able to borrow some from John Atwood for the tests below (many thanks, John). This type seems more common than the others. Examine the photo carefully, and you will see nothing but wretched excess. This is a 12.5 watt beam tetrode, a small tube similar to a 6BQ5. Mica spacers would be more than adequate, yet all the spacers are made of ceramic. Note the numerous structural supports, just the ticket for 500g mechanical shocks in a missile. The glass envelope isn't regular glass at all, but Nonex, a type of silicon-boron "hard" glass only used for transmitting tubes and lamps which get very, very hot. It's more difficult to see the cathode construction deep inside, but the heater isn't just coated with alumina, folded and inserted into the cathode sleeve. Instead, Red Bank engineers went back to 1928 for a vulgar, extravagant touch; the heater is threaded into tiny holes in a machined ceramic block, which is then inserted into the cathode. The only other place you'll see this is in very early indirectly-heated tubes like the UX-227. It was very costly, so as soon as the alumina coating was perfected, the ceramic block disappeared. Its use here is mute testimony to the purity of design practiced by Red Bank. It gives the 6094 a heater-cathode voltage rating of +-450 volts, and since the plate rating is 275 volts, you have to think that this tube is rated in a grossly conservative fashion. 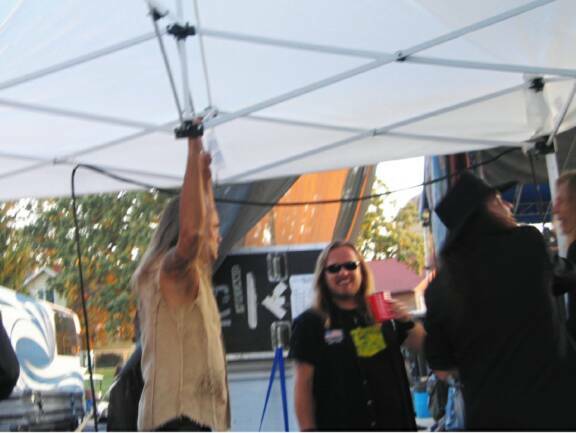 This also gives a very long warm-up time. The photo shows some of the variations of the 6094. The original Bendix Red Bank was the 1950s original, while Tung-Sol made a version from the late 1950s until its purchase by Webster Electric in 1970, and up until it closed its doors in the late 70s. The Cetron starts in the 70s and looks suspiciously like the Tung-Sol; the same tooling may have been used. Cetron 6094s apparently were made until the late 1980s. I made two adapters to allow plugging 6094s into EL84/6BQ5 sockets. Although the EL84 has much more gain, the 6094 is similar enough to work well in a variety of EL84 amps. (It is actually more similar in characteristics to the 6CW5/EL86 ­p; tech. ed.) But the pinout is different, as it is on most Red Banks. First a single-ended listening test was done, using the VTV test amp with no feedback and comparing with some EL84s. We agreed in general on the EL84s; all had quite distorted and bloated bass, and highs that varied quite a bit. The Sylvania 6BQ5, from the 1970s, had modest detail and was very warm. The Sovtek EL84M was somewhat better balanced in sound, while the Yugoslavian EI EL84 had a glassy effect in the midrange and accentuated highs. All the 6094s were lower in voltage gain, but used virtually the same bias point at 300 volts. They were much clearer than any EL84, with clean bass, very nice highs and a slight nasal quality in the mids. There were some small differences between the versions, the Bendix was a little softer-sounding while the Cetron and Tung-Sol showed a bit more treble detail and the Tung-Sol gave a "forward" effect to the drums. Then a matched pair of 6094s was plugged into one channel of an Eico HF-86 amp. This is one of the finest-sounding EL84 stereo amplifiers ever made. The example was in near-new condition and was provided by our publisher. Upon comparison with a pair of fresh Mullard EL84s from the 1960s, the 6094s gave slightly cleaner bass and a less congested midrange. Imaging was excellent with both tube types. The difference was not as dramatic as in the SE test, and the difference in tube gain was less noticeable, due to the considerable negative feedback in the Eico amp. Yet a small improvement was apparent. Even though they sounded cleaner than EL84s, the 6094s gave considerably higher distortion readings on the test amplifier than typical EL84s. The distortion at 300v 40 mA, 1 watt into 3200 ohms, was on the order of 0.9% to 1.2%, while EL84s average around 0.9%. This load is rather severe for the 6094s and probably favors the EL84s. Peak power from the 6094s was about the same as from EL84s. And for toughness, even the old 7189A is a toy. I put 500 volts at 40 milliamps on a 6094's plate, with 300 volts on the screen. It didn't even blink. No red spots on the plate or the screen, no creaking. Try that with any other 12-watt tube, and you'd better stand well back. The debate often taken up in various magazines, about which 6L6 type is "best", seems a bit silly if the 6384 is compared to the available 6L6 types. Even the Tung-Sol 5881, Mullard EL37 and Genalex KT66 look like fragile and lightweight toys next to the Red Bank tube. So it's safe to say: you won't see the likes of this tube again. The base is some kind of ceramic material, and is one of the few ceramic octal bases I have ever seen. The construction is the same luxurious style as the 6094, with all-ceramic spacers and a heater block. The pinout is the same as the obscure Tung-Sol 6AR6, a very similar tube to the 5881 physically but not quite the same electrically. Still, the 6AR6 or 6384 can be easily substituted into a 6L6 socket with rewiring or an adapter, and are rated closely enough to work well, though the 6384 makes the 6AR6 look pathetic. Extreme scarcity means we had only one 6384 to test, a new-in-the-box original Red Bank. The plate rating is 750 volts at 30 watts, which is outrageous for a 6L6 type and more typical of the infamous Mullard EL37. Yet EL37s bring $200 or more on the current NOS market, while 6384s are scarce but have nearly no value. It shows how narrow-minded the gurus can be. Simply rewire your amp's sockets, and you can use this "Beastatron". Tests showed that it is indeed a beast. At 300v 50 mA, distortion was 0.77%, lower than that of a typical Tung-Sol 5881. Peak output was 9.8 volts, far more than most 6L6 types and even better than a KT66. It's a shame that so few modern hi-f amps use 6L6s, as the 6384 is a hot little number. Oddly enough, the single sample made a chorus of tinkling sounds while heating up and cooling down. It didn't appear to affect electrical behavior. I briefly put 500v 75 mA into the tube, and it continued to work without showing red spots on the plate. I believe this to be the frst-ever Red Bank electron tube. When it was introduced in May 1952, Bendix called it the "Eclipse-Pioneer" tube. This was because Red Bank Division started out as Eclipse Instrument Company, a maker of aircraft electrical generators in the 1930s. It's hard to find out why Bendix started making tubes there, knowledge was lost over the years and Red Bank Division itself is believed to be defunct. The 5992 is a 6V6GT with balls. Although rated for 10 watts and 300 volts, its construction is the same kind of wretched excess. So it's probably safe to assume that this tube can take far more than the rated voltage. The pinout is identical to 6V6, so it can be used in 6V6 guitar amps with no changes. Unfortunately, some gurus have found the type in their GE tube manuals, so samples are very hard to find even by Red Bank standards. 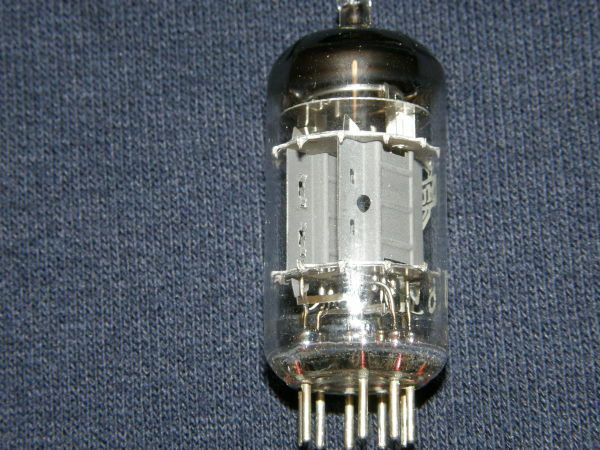 The 6900 is a version of the 5687 medium-mu triode. Like the power types above, its construction is massive, though it does feature a mica spacer. It plugs right into a 5687 socket and works. Its transconductance is about twice that of a 5687, making the 6900 a very intriguing item for high-end audio equipment. I've seen a few in surplus, so some fairly common military radio gear must have had sockets for it. The 6385 is a dual triode which can replace the 2C51/5670 VHF triode. Since the 2C51 is a good-sounding signal tube, the 6385 may make an excellent line amplifier. We did not have any to test, again due to its scarcity. Red Bank tubes may be the ideal devices for the guitarist who loves music enough to buy only the very best. They were created to help destroy the "Red Menace", and represent Pentagon spending excess reminiscent of those $700 toilet seats, in 1950s electronic form. At that time, one could buy a very good 6L6GC for $3, while a 6384 (assuming you were permitted to buy one) was $50 or more. Imagine someone today paying $1000 for a 6L6, and you will get the idea. It does seem more appropriate to use these expensive "Commie smashers" for making and listening to music instead. In a world drowning with advertising hype and ego, it's nice to know of something that is unquestionably "the best". As a postscript, it does seem that Richardson/Cetron has made these tubes up until recently. So they may still have the special tooling, stowed away in the warehouse. If enough demand for Red Banks reappeared, Richardson might be interested in restarting production. a) be sure pins 1 and 8 are open. b) lift wiring on pin 2 (grid), move to pin 1.
c) lift wiring on pin 7 (plate), lift wiring on pin 9 (screen). move screen to pin 7, plate to 9.
d) lift wiring on pin 3 (cathode), move to pin 8.
e) lift wiring on pin 4 (one side of heater), move to pin 3. Bias adjustment not needed but voltage gain of amp will be less. a) lift and relocate any wiring on pin 1 and 6.
b) lift wiring on pin 8 (cathode) and move to pin 1.
c) lift wire on pin 7 (one side of heater) and move to pin 6.
d) lift wire on pin 2 (other side of heater) and move to pin 8.
e) lift wiring on pin 5 (grid) and move to pin 7.
f) lift wiring on pin 4 (screen) and move to pin 5.
g) a small adjustment may have to be made to biasing. Note that 6384's heater draws 1.2 amps, so the power transformer must be capable of supplying the extra current. Excerpts from original article in Fall 1996 Vacuum Tube Valley Magazine. This back issue is available - see home page. If you ever find yourself being harassed by a techie who insists upon criticizing you for your interest in vacuum tubes, there is an easy answer. He can be silenced with a simple question. Ask him if any early type transistors will still be manufactured and used in new products in, say, the year 2030. If he's honest, the answer will be "no". Then tell him that the first-ever beam power tube is still selling in the millions today, and shows no sign of becoming obsolete ... after 60 years. That should get rid of him. As of March 1996, the mighty 6L6 is celebrating its 60th birthday. It's still being manufactured, in Russia and China. And its popularity in guitar amps is assured for the conceivable future. 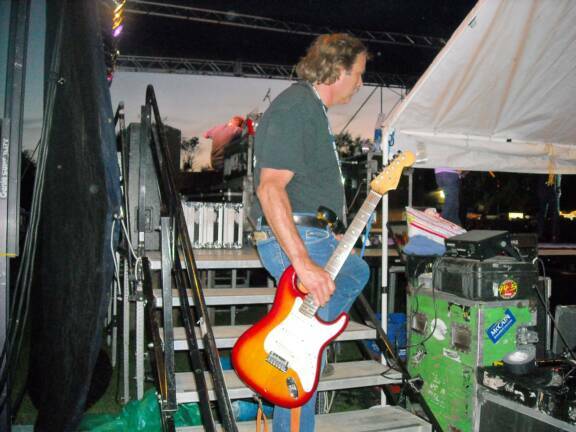 Various "experts" in the mainstream electronics industry, who relentlessly kill old technologies and curse people who use them, can do nothing about the 6L6--it continues to be a dominant voicemaker of rock'n'roll guitar. Many "experts" have tried to simulate the 6L6 guitar amp with various semiconductor-laden gizmos, from complex analog computers to DSP chips. With varying technical success, and with little or no financial success. There are numerous companies making 6L6 amps today; companies such as Fender, Mesa-Boogie, Ampeg, Peavey, Kendrick, Victoria, Soldano, THD, Louis Electric and many others have staked some of their product lines on the 6L6. So don't accept the mutterings about "dead technology". In 1931, the audio outputs of radio sets were dominated by triodes such as the UX-171 and UX-245. But even though push-pull 245s could produce 5 watts easily, there was ongoing pressure from manufacturers for ever-more-efficient output tubes. The pentode was the answer at first. It originated in Europe, with the first American power types being the Champion P-704 and Arcturus PZ. These were very early types and had some reliability problems. They were quickly superceded by RCA's UX-247, released June 1931. Suddenly you could get 2.5 watts out of a single tube, at only 250 volts! Millions of radios used the 247, and its descendant, the 42 with its 6.3 volt heater, was even more popular. The 38, 48, 59 and 2A5 followed, as did European types such as the Mazda AC/Pen, Cossor MP/Pen, Osram MPT4, Mullard PenA4 and numerous others. But RCA engineers were pursuing more lofty goals: low distortion with high efficiency. They were developing special power tetrodes, such as the 46 (intended for Class B push-pull and giving 20 watts from a pair) and the smaller battery-set types 49 and 52. Late 1932 saw the 48, which (unlike the 46) was intended to have its screen grid connected only as a screen grid, not in parallel with the control grid as in the 46. A similar development in Britain was the Hivac "Harries". But the 48 was the ultimate father of the 6L6, and all that came after. This is a good place to describe the technical basics. In a triode (Fig. 1) electrons are boiled off the cathode or filament by heat. The electrons are attracted strongly to the positively-charged plate. But to get to it, they must pass through the control grid in their path. By varying the voltage on the grid, the electron stream is varied. Simple enough. Unfortunately, there are two problems here. First, the capacitance between the plate and grid is magnified by signal feeding back from the plate. This is the "Miller Effect", and it limits the high-frequency response of any given triode. The second problem is due to the electrons as they reach the plate. Some aren't absorbed, but bounce off and wander around. These "secondary emissions" may return to the plate, or they may enter the grid, or they may just be wasted against other parts of the tube. So triodes have limits on their frequency response and efficiency, when used as power amplifiers. In the 1930s the problems were difficult to get around; triodes with low capacitance were eventually designed. But at the time, efficiency was best improved by adding another grid (Fig. 2). This was called a "screen" grid, because it acted as an electrostatic screen between the grid and plate, reducing the plate-grid capacitance. This opened up the short-wave bands, because the screen allowed greater frequency response. It also increased gain, as the fixed voltage on the screen made the plate current less dependent on the variations of plate voltage. The resulting "tetrode" became a standard for RF amplifiers in radios, and the RCA 48 was about as good as a tetrode could be made for audio. It was a peculiar and transitional tube, with a huge cathode and a set of small Barkhausen plates on the inner surface of the plate to improve electrical performance. But when used for amplifying audio, tetrodes have a problem. The secondary emission can be attracted to the screen grid, which lowers the plate current for low plate voltages. This is the famous "tetrode kink" (Fig. 3). It is a source of distortion in audio, and represents some wasted energy as well. Because of this, a third grid was added between the screen and plate (Fig. 4). The "suppressor" grid is widely spaced and is at the same voltage as the cathode. Thus, secondary electrons which bounce off the plate will be repelled away from the screen and back to the plate. The kink disappears, and we have a "pentode". Gain and efficiency are very high, frequency response is excellent, distortion is lowered. Even so, the RCA engineers knew that the pentode has problems. One obvious one is that the screen and control grids are wound with different wire spacing. So, some electrons will pass through the spaces in the control grid, only to strike (or be deflected in a useless direction by) a screen-grid wire directly in that space. That electron is wasted energy, and does not reach the load. The electrons that strike the screen just heat it up. A similar interaction can happen with the screen and suppressor, but mostly involving the secondary electrons. And some electrons can pass through gaps at the top and bottom of the grid assembly, or strike the siderods of the grids. So the main electron beam can have a circuitous route. Most of the wasted energy heats the grids, which in an extreme case can make them emit electrons, causing the tube's plate current to run away. The solution was well-described in O. H. Schade's classic article in the PROCEEDINGS OF THE IRE, February 1938. Schade and his fellow RCA engineers made two blindingly simple changes which rocked the electronic world. First, they wound the control grid and the screen grid with the same spacing. The wires were aligned, so very few electrons would strike the screen. Second, the suppressor grid was replaced with a pair of "beam plates" on either side of the grid structure. Any electrons that flew past the siderods would be forced back into a nicely-ordered set of beams that passed from cathode to plate with little interference. The result was extremely high efficiency, high linearity and lowered grid heating. The first production version of this was encased in a metal envelope with a then-new octal base. (Fig. 5) Thus was born the 6L6. It was an immediate hit. All the major radio manufacturers started using it in their audio output stages, thus elbowing out old tetrodes like the 46 and 48, pentodes like the 6K6 and 6F6, and triodes like the 45 and 2A3. And new applications appeared; ham-radio operators found that it could give usable power in a transmitter, even at shortwave frequencies, and at far lower cost than previous tubes. The cost of PA amplifiers was affected by the new tube, as it was now practical to get 25 watts without using four 2A3s or expensive larger triodes like the 50 or 300B. Only two 6L6s were now needed, at a fraction of the cost. Excerpts from original article in Summer 1996 Vacuum Tube Valley Magazine. This back issue is available - see home page. Just as the competition for more horsepower was on in Detroit in the early Sixties, the race for more watts was running at the local hi-fi shop. With the advent of inefficient speakers like the AR-3 acoustic suspension speaker in 1959 and the larger, concert hall speakers like the B-310 Bozak Concert Grand (which actually came out in 1951), more watts were needed for more realism. In the post-war mono era, 10 to 30 watts was more than adequate for the popular, large horn-type speakers (read: Altec, JBL, Klipsch, Tannoy, etc) with 12 or 15 inch woofers and compression-type horn high frequency drivers. On many of these systems, a two watt triode amp is more than enough to drive you out of the room with volume. However, inefficient speakers like the AR-3 needed at least 35 to 40 watts continuous to get any volume. Even the famous KLH Model Nine Electrostats needed at least 40 watts continuous for any volume. This inefficiency trend still continues today with most speakers being no more efficient than 87-91 dbA one meter @ one watt. But that is another issue to be covered at a later date. About the same time, a number of hi-fi manufacturers took on the challenge to develop and market tube stereo "super power" amplifiers in kit and/or assembled form. Acrosound developed the UL-120, a 120 watt stereo power amplifier kit using Ultra-Linear T0-600 output transformers driven by push-pull KT77s. A similar amplifier kit was sold under the Radio Shack label as the HK-210. In late 1960, EICO brought out the HF-89, a beefy 100 watt stereo amplifier kit with push-pull EL-34s. Lafayette introduced the KT-550 in late 1960. The KT-550 was actually designed by Stewart Hegeman and featured push-pull 7027As generating 50 watts per channel continuous. H.H. 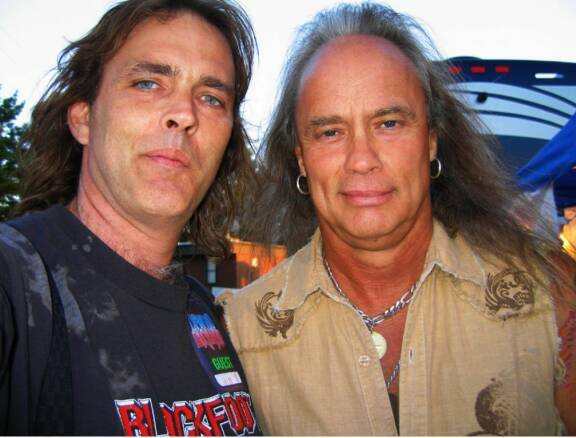 Scott came into the fray with their powerful LK-150 - 65 watt per channel amplifier kit using pentode-connected Tung-Sol 6550s and huge, in-house wound output transformers. Finally, McIntosh unveiled their legendary MC275, a 150 watt chrome stereo powerhouse that is still a demand item and status symbol in today's crowded audio amplifier market. Clearly, the race for high power amplification was on! Hegeman's approach to designing the Citation line was from a professional recording engineer's perspective. When you listen to recorded music for a living, listener fatigue becomes a major concern. Hegeman felt that distortion and frequency response were main factors in amplifier design and superior performance. He believed lower distortion, wide bandwidth and multiple feedback loops were essential for realism and to reduce listener fatigue. The amplifier must have minimal distortion to reduce the overall distortion generated from the cutting head, cartridge and speakers. "Distortion", he said, "is a deviation from the original. It includes harmonic, transient and intermodulation distortion components as well as phase response, restricted dynamic range and restricted distribution patterns from microphones and musical instruments". Frequency response of the amplification system was another major design consideration. The musical response bandwidth must extend considerably beyond the hearing characteristics of the human ear in order to provide satisfactory reproduction. 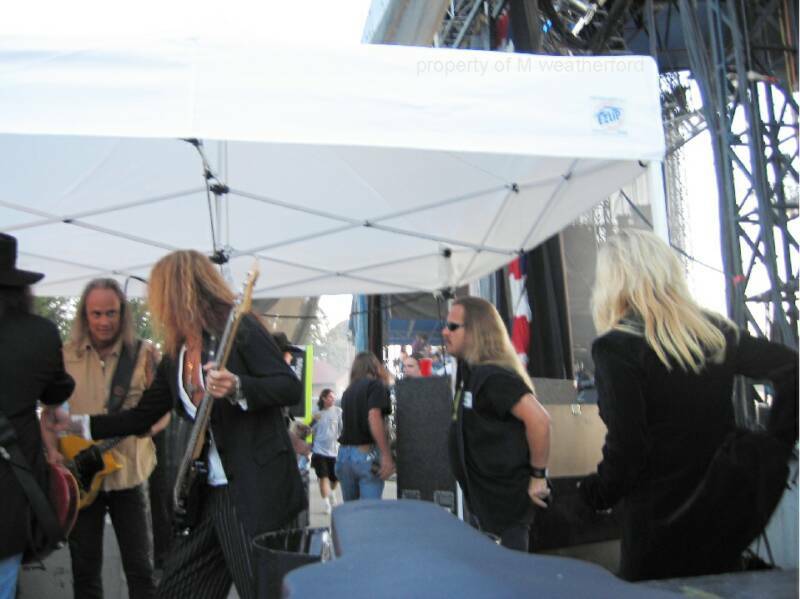 Thus, the concept of "wide band" amplification further developed. Hegeman felt that amplifier performance below the 20 cycle range is very important to a tight and clearly defined low end. Conversely, an amplifier which has a frequency response beyond 100,000 cycles without evidence of ringing or instability when hooked to a reactive load can offer clean, transparent tone in the higher frequencies with outstanding instrument separation. In the Fifties, the use of feedback in amplifiers was controversial in some amplifier designs. Typical amps back then used a "single loop" feedback circuit from the voice coil terminals to the cathode of the input tube to smooth the frequency response and lower distortion. This approach limits usable feedback to 20 - 26 db. This method can reduce distortion components by a factor of up to 20 to 1. Hegeman felt that a "multiple loop" method to increase the overall feedback was the answer to providing lower distortion without sacrificing stability. Multiple loops become additive if their ratio is adjusted to the relative degree of distortion produced. Thus, if one stage has twice the distortion of another, it should have twice as much feedback around it. The three feedback loops employed in the Citation II include: one from each 12BY7 driver tube plate to its own grid, one from each KT88 output tube plate to the opposite driver grid and one from the secondary of the output transformer to the cathode of the 12BY7 input stage. With this design, 32 db of overall feedback was achieved in the Citation II with unconditional stability. The power amplifier consists of two identical 60 watt continuous rated power amps on one chassis with a shared power supply. The power supply is a low-resistance voltage doubler type with silicon rectifiers, more than adequate capacitance mounted under the chassis and a filter choke for B+ filtering. Basically, the amplifier design employs a distributed-load (Ultra-Linear) output circuit using KT88 power pentodes operating in push-pull with fixed bias. Still thought by many as controversial, 12BY7A video-output pentodes were used in all low-level stages for extremely wide frequency response and minimal distortion. To test the wide frequency range, pulse amplifier techniques were applied to the 12BY7A video pentodes feeding into a low impedance load which provide a flat frequency and phase response beyond the capability of the output transformer. 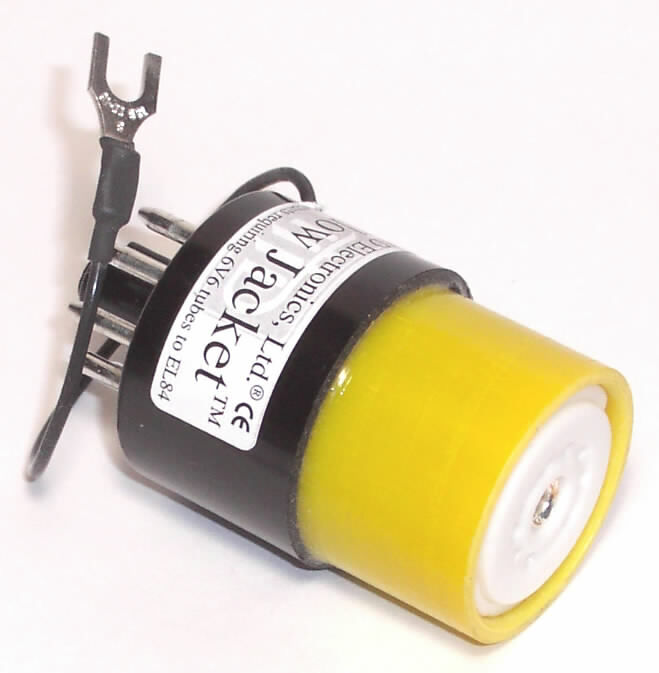 Speaking of output transformers, the Citation II's were outstanding! They were huge, well-potted units that had extremely wide response characteristics. Leakage inductance in these transformers was kept to an absolute minimum and the distributed capacitance of the primary halves were carefully balanced against each other to maintain natural resonances of the unit well above 200,000 cycles. The massive design utilized the highest grade core materials available which, lowered the effect of core distortion to a region well below the limit of human hearing. With feedback, the Citation II transformers were capable of high frequency response up to 270,000 cycles! 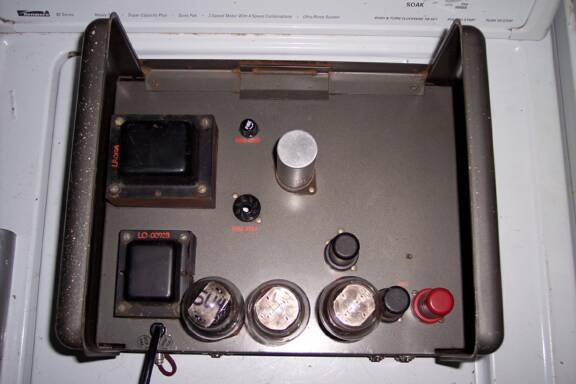 There appear to be three distinct variants of these units: the early version had cloth tubing to guide the wire out of the bottom of the transformer, the next version had rubberized cloth wiring for the same purpose and the last version had the wire going through rubber grommets on the bottom of the can. Apparently, the first versions of this transformer did not have the performance of later versions according to local amp builders and transformer experts. Freed Transformer Corporation of New York was the sole manufacturer of the output transformer and the part number is FT-3273671A. Freed also made the power transformer for this unit. Tube manuals are a necessary part of the tube audio enthusiast's library. They provide a wealth of information that helps one to appreciate his equipment and are a necessity if one wants to design or build his own equipment. They also can be useful when troubleshooting; especially when one does not have a schematic. The problem is that there are a lot of tube manuals around. While some tyros want as many manuals as they can find, many of us are limited by space, or other considerations, and just want a practical number that will satisfy our needs. In this article, the author will review a number of different manuals in the hope that this exercise will enable the reader to be able to intelligently choose the manuals that will be the most useful for his needs and, perhaps, save some space and money as well. The first company that we will explore is RCA. Their manuals seem to be the most commonly available and, therefore, merit the closest consideration. They are the ones that one is most likely to find at bookstores, swap-meets and through the mail. RCA tube manuals come in many different types. According to Barry Nadel, who has made a study of the RCA-Cunningham series, the series went from RC-11 to RC-30 (1975). There were separate RCA Radiotron and Cunningham manuals published prior to 1932. A single example, R-10 is known to the author. It is postulated that the "RC" designation delineates a combination of the Radiotron and the Cunningham manuals. The "RC" series of softbound RCA tube manuals started about the same time as did the beginning of High Fidelity, 1932, and continued to the end of the tube era. Each of these manuals contains a wealth of material, much of which is repeated from manual to manual. One need not own the entire series to obtain the information he needs. As older tubes became obsolete (in the eyes of the manufacturer, not necessarily the tube enthusiast), they would be relegated to the back of the manual and less information would be given about them. Therefore, it behooves the enthusiast to acquire at least some of the older numbers to be sure to have all the necessary information. For this article, we will examine RC-11, RC-15, RC-20, RC-23, and RC-29 Receiving Tube Manuals. RC-11 manual was printed in 1933. Herein, one will find the 2A3, the 2A5, the 250 and even the '01A discussed in detail. The manual starts with a discussion of vacuum tubes. The end of the book has circuit diagrams showing "typical" examples of various circuits, as well as tabular tube information, base diagrams and obsolete tube information. This format was followed throughout the series. Manual RC-15, from 1947, is almost twice as thick as RC-11. While there is great detail for the 2A3 and the 6L6, the 10 and 50 tubes are discussed only briefly. There is a nice discussion of resistance coupled amplifiers, along with the usual circuit diagrams and tabular information. This manual was printed at the start of the "Golden Age" of High Fidelity. RC-20 was printed in 1960, towards the end of the "Golden Age", when stereo was becoming fully established. It has much interesting information for the High Fidelity amplifier designer and appreciation. Various circuits used in Hi-Fi applications are discussed in detail. The 2A3 and 6L6 are still mentioned in detail, but most of the early triodes are barely mentioned. Few industrial numbers are mentioned (5581, 6973, 7025, 7189, 7199 are), and only one foreign-numbered type is mentioned. RC-23 (1964) is essentially the same as RC-20, except the 2A3 is obsolete and there are more of the industrial types. RC-26 (1968), is heavily weighted toward the (then) latest tubes and only has older tubes very briefly mentioned in the back. RC-29 (1973) is similar to RC-26, except that there is more emphasis on the industrial and foreign tubes. As one can see, possession of a smattering of these manuals can give the enthusiast much of the tube information that he needs. 5992This is a military/industrial version of the 6V6GT, and is rather rare. I have only seen versions labelled Bendix, but GE lists it in their Characteristics book so they must have made some as well. These have rugged brown micanol bases, heavy glass, a short boxy black plate structure, three mica spacers and dual top mounted D getters. This is probably the ultimate holy grail tube to have in the 6V6 world, but their scarcity today keeps them in a fairly obscure corner of that world. Clients tell me these blow away even the NOS RCA blackplate greyglass tubes! They are indeed awesome, and will never be made again. All of these tubes glow blue inside and have slightly longer warm-up time than the 6V6GT, this is normal. They are plug and play compatible with any 6V6 type tube, with normal bias checks and/or adjustments as you would do whenever replacing any power tubes. These are worth seeking out as they are built like a tank and may outlast both you and your amp! A very rare European type of 6SL7. Philips are what are mostly seen, if rarely. The Holland made versions are similar in size to the "tall boy" USA types. These usually have high-mounted cylindrical plates, and brown micanol bases. These are sweet and rare versions of the 6SL7, and are plug and play compatible with any 6SL7 or 5691 type tube. Some say they have all the best attributes of the 5691, with better richness and vocal clarity. Very hard to find in the USA, and worth grabbing whenever you can find them! KT-66: This version is the European equivalent to the 6L6GC and the 7581 type. These often have a fairly large coke bottle ST shape, and are found in both clearglass and greyglass. They can be used to replace virtually any 6L6 type. 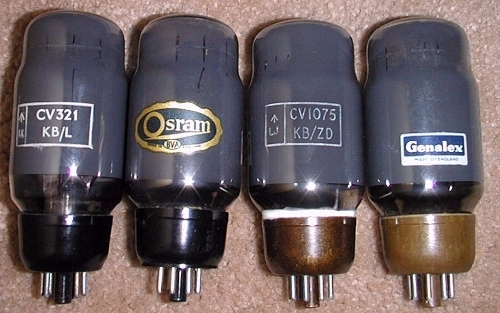 Most of those available were made by the Marconi-Osram Valve Co., under their Genalex label, or may be found with either the "Marconi" or "Osram" label. A premium audiophile version was introduced in the late 1950s under their "Gold Lion" label. 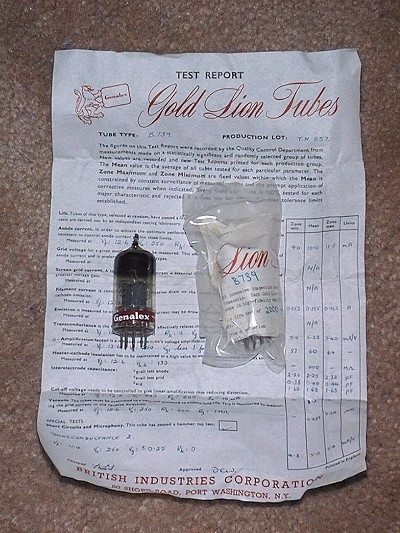 These were screened for audio use, with handwritten data sheets included in the box with the tube. The Gold Lion types are unmistakable with their elaborate gold label bearing the lion and the words "Gold Lion" in gold script. 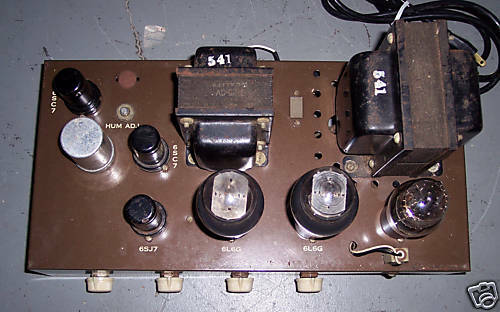 The Genalex, Marconi, and Osram types used a grey, blue and white decal on the glass, with often a white box containing "KT-66" elsewhere on the glass. Sometimes these can be found in factory matched pairs. M-O Valve also made these for Mullard and other European brands. The rarest are those with blackplates, grey glass, black bases, and a cup shaped metal getter. There is also an American made version of the KT-66, made by GE, which also usually is marked 7581A in addition to KT-66. These are excellent tubes on par or better than the vintage 6L6GC made by GE. They can be found in blackbase, brownbase, and light beige colored bases that were usually made for OEM use in amplifiers. EL37: This is the European version of the 6L6. It was nearly always glass, and can be used to replace any 6L6, G, GA, or GB type, or 5881 as long as your amp does not put more than 360 volts on the plate and 270 volts at 2.5 watts on the screen. These types are said to sound better than the USA versions, and are very scarce in America, as well. 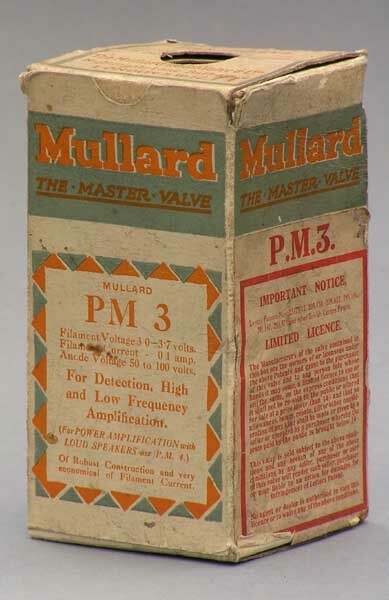 Mullard is the brand most often encountered in the NOS market. 5881 / 6L6WGB: This type originally was known as the 6L6WGB, and was designed for the US military. Nearly all were made by Tung Sol. The tube is a short flat topped tube with a brown base, and a large grey plate structure inside. These often had large top getter patches, but there are some with side getters. The design proved so popular that an industrial version was created and labeled the 5881. Both tubes are the same. These are slightly more powerful than the 6L6 standard types, having 360 volts at 23 watts on the plate and 270 volts at 3 watts on the screen. They can replace any 6L6 type except for the GC, 7581, or KT66. They MAY POSSIBLY be used as a sub for these tubes, but ONLY if your amp does not exceed the ratings of the 5881! Most amps calling for a 6L6GC type will exceed these ratings and the 5881 may overheat or arc over, so check first before subbing these! This is a fine tube used in many high fidelity amps, and packs a wonderful sound into a small package. Found also in RCA, GE, Sylvania and other brands, but nearly all were made by Tung Sol. 5932 / 6L6WGA: A military type of 6L6GA, short and very fat, thick glass, blackplates, with large brown micanol bases. Sometimes late 1940s military stock turns up and these look more like a cross between a 6L6G and a Western Electric 350B, with an ST coke bottle shape envelope. These share the ratings of the type 6L6, G, GA, and GB. They are built to take a beating, and may be a long lasting choice if replacing any of the above 6L6 types. Said to be among the best sounding outside of the 6L6GC blackplate types, but they are very scarce. 350B / 350A: This is a large coke bottle shaped tube with black plates, usually only found in the Western Electric or National Union brand (made by W-E I believe). This tube has roughly the same specs as the 6L6GC and KT66 varieties. The 350B has the standard octal base, while the 350A has the old-fashioned 5-pin base with no center plastic keyway pin, and the plate connection on a top metal cap. These are said to be the best sounding of this family, on par with the best of the Genalex Gold Lion series, but are very scarce. Western Electric tubes were noted for quality and long life, so if you find a pair, it may be worth your while to try them out! The Amperex can be found with a white label and the treble clef logo (rare), the Bugle Boy cartoon tube logo, Amperex in white ink, and the orange world logo. The Bugle Boy is the most popular, almost to being a "designer" label, which has driven the price up and supplies down. Amperex made many tubes for the USA market, mainly for Zenith and Motorola. These are excellent tubes, identical in quality to Bugle Boys. The sound is gentle with nice air at the top, and a carefully controlled warmth in the lower mids. They usually say "made in Holland" in white around the top, and have the Heerlen, Holland factory code near the bottom. All of the Dutch Amperex and Philips made tubes were burned in at the factory, which created small "sooty" patches inside the glass in the genuine old tubes. This is not a sign of use or wear, but rather a sign of authenticity. Watch for the 1950s vintage versions with the "D" shaped top getter, as they are rare and fine. They are getting pricey due to demand outstripping supply. Mullard EL84 tubes were made in both the old "shield" logo in white ink, and later the IEC/Mullard logo in white. They are rarer than Amperex, but worth seeking out. The are powerful, yet creamy, with a nice deep richness and warmth in the lower mids and bass. Mullard made these for GE, Raytheon, Admiral, and many other USA brands. They can be spotted by the seams on the top of the glass, "Great Britain" in white at the top or bottom, and the "B" code for the Blackburn factory at the bottom. Like the Amperex tubes, Mullard tubes are burned in at the factory, so even new ones have small "sooty" looking spots near openings in the plate. Just a few hours of use will make Mullard tubes get large sooty patches inside the glass. This in no way affects the life or sound of the tube. Many found today were "aged" at the factory or by hi-fi shops, and the sooty marks inside the glass is actually a sign of authenticity, as the fakes will not develop the dark marks. Again, watch for the 1950s versions with the square top getter, they are just great. Siemens and Tungsram tubes often look very similar to Amperex. Most have the Munich factory mark near the bottom, looking like the "unequal" sign (equal sign with a slash thru it) and plates similar to Amperex. Siemens have a number molded in the glass on the bottom, and usually say "made in Germany". They made many EL84 tubes for Realistic-Radio Shack with gold pins. Tungsram are also nice German tubes, usually with "made in Austria" printed on the bottom. Two types of plates were used, one type with a slit in the center like Mullards, and another with several large circular holes in the plate. Early Austria-made Tungsram tubes are easy to spot, as the gettering process usually made large, bright silver spots on the glass at every opening in the plate. This is normal, and not a sign of use!